Before the break, Juuse Saros played an excellent game in net against the Golden Knights, his second such terrific start facing Vegas this season. About a week prior, Laurent Brossoit played the game of his life for the Jets against the Golden Knights. These three performances have led to a common belief that back-up goalies dominate the Golden Knights. why do we keep getting backup goalies having career nights? Lack of tape on them? They just playing out of their minds? Curse of the backup goalie. This team settles for mediocrity against good teams a lot. What's with us and backup goalies playing their best? How many backup goalies can we make look great this year??? Ton of low risk shots on net from mile away to pad our stats . If you get 6 power plays and can not land even one goal its hard to make a case for earning any kind of win! Honestly, going into the research, I kind of expected to find exactly what everyone has been saying, that backups do indeed play better against Vegas than they do normally. However, after looking up the numbers it’s much more of a case of the Saros and Brossoit curse than it is all backup goalies. The Golden Knights have faced 12 backup goalies this season. Their record in those games is 5-4-2. In the 12 games, the backups have recorded a .920 save percentage and have allowed 32 goals for a goals against average of 2.86 (Cory Schneider was pulled early so the GAA number is a bit inflated). The backup outperformed his season averages in five games, underperformed in four, and hit the averages in three. 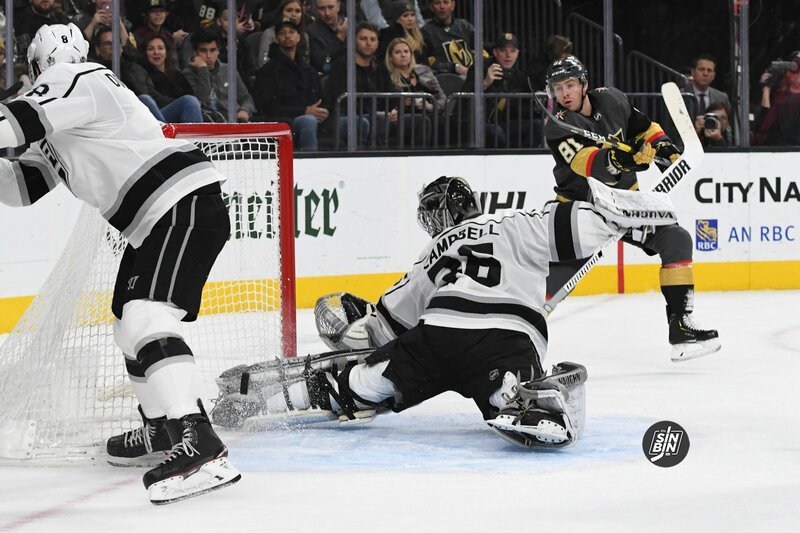 Aside from Saros and Brossoit, Jack Campbell (LAK) and Philipp Grubauer (COL) were the other two to over perform, both games Vegas went on to win. If you take out the two great games from Saros and the unreal game from Brossoit, Vegas’ record against backups is a stellar 5-1-2, and the goalies’ numbers are .898 SV% and 3.57 GAA. It’s not just Vegas that have been bitten by Saros and Brossoit either. Both goalies have a better SV% than Marc-Andre Fleury this season. Combined, those two goalies are 22-8-2 with a SV% of .925 (Fleury’s is .911). Seven of the 12 backup goalie appearances have resulted in a SV% of .900 or worse. Also, the Golden Knights have scored at least three goals in seven games against backups and have not been shutout in any of the 12 games. All in all, backups play like backups against the Golden Knights… unless their Juuse Saros or Laurent Brossoit. Why do the VGK’s have Subban and not use him? If he is not going to be used, then why not get a quality goalie as a tandem to Fleury? Fleur is “awesome”, but the best team’s have a great 1-2 punch with goalies: Nashville, Boston, NY Islanders, etc. Why not get: Bobrovsky, Quick, or another ” proven” goalie to solidify the goalie “issue”. Fleur is awesome, but why not get another proven goalie for 3-5 years; wouldn’t that be smart and enough time to ” mentor” the next generation of goalie? Fleur is running out of gas, no knock on him; why not be “pro-active” and address all issues and stop “hoping for better” and fix all “issues” while there is still time? Look at Vasilevskiy (spelling? ), Biddington (St. Louis), Hart (Flyers), etc.! Let’s “get on it” NOW…only 6 points ahead of 4th place and losing 10+ games at home? Where is “the HARDEST WORKING TEAM in the NHL (VGK’s)? Give 110% for 30-45 seconds per shift, for 6-7 figures per year; is that too much to expect??? Effort is within everyone’s grasp, JUST DO IT! The VGK’s are not guaranteed a playoff spot; new season starts TODAY, get on a huge WINNING STREAK…(40 in a row! ); why not?? ?